As a Classical Guitar student in college i've been a huge fan of the High Tension strings, while trying different strings i stumbled upon these and i really can't express how great they are the basses are full of clarity, power and singing quality to them while the trebles are beautiful and bright, definitely love the spectrum of colors that i was available once these were on my guitar! 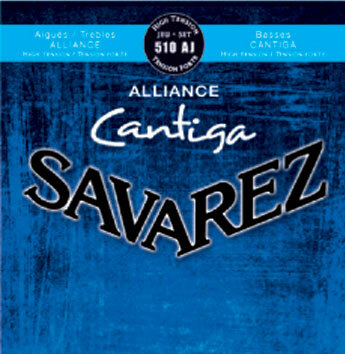 To be honest....I've tried MOST of the best named brand of classical guitar strings out there in the market, but in my "heart of hearts", THESE full set Savarez Cantiga high tension strings is the best (speaking for myself only of course). But, of course, every name brand name strings have their own advantages and disadvantages. I hate to compare brands, and so I leave it to the guitarist to choose the best for themselves...afterall, every guitarist is different, has a different "ear" & "feel" on the strings they play. However, one can't go wrong with these Savarez Cantigas! BTW, I would not hesitate to check out D'addario Dynacore too! Again, "TO BE HONEST".